Which beauty box should I subscribe to? I have to admit, before these boxes arrived I was edging towards cancelling my Boudoir Prive subscription. 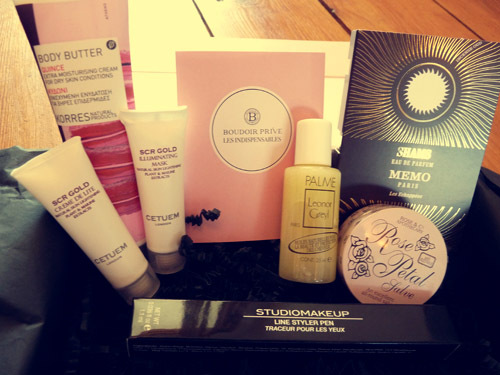 They didn’t seem to include as many full size products as Glossybox (I know that’s a ridiculous criticism to make of a beauty sample box, but it is such a treat to receive a full size product!) and because they offer more ‘luxury’ brands I end up finding a product I love and then realising I would never spend that much money on the full size product (the Creme De Lite moisturiser for example, is £45 for 50ml). But when I unwrapped this month’s box I was very pleasantly surprised – I have bought the rose petal salve before and loved it, the body butter smells very yummy and I am a big fan of this style of liquid eyeliner. Likewise I was really impressed with the Feel Unique box. At £9.95 they’re the cheapest boxes, and I love that, as an established beauty website you can easily buy any of the products if you like them. In particular the Tigi Catwalk Blow Out Balm is a new favourite of mine – it smells amazing and leaves my hair feeling so soft. I have only had one of these boxes so far but I would definitely be hesitant about cancelling – although they’re the less well-known of the beauty boxes, for me, they’re a strong contender. 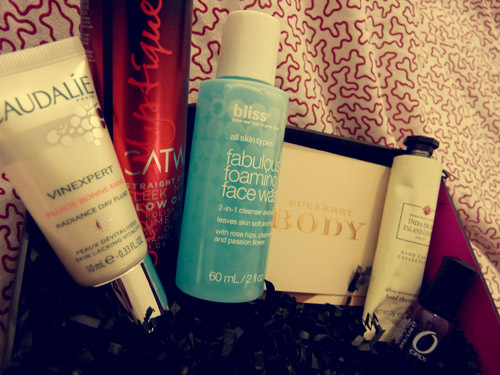 Before this month I was convinced Boudoir Prive would have to get the chop but I’m now edging towards Glossybox. At £12.95 they’re the most expensive of the boxes and when I look in my tub in the bathroom of samples I probably won’t try, there are more Glossybox samples in there than anything else (with the neon yellow rebel nails toenail stickers right at the top!) The only thing I’m certain of is that I’m going to carry on with Feel Unique. So, in conclusion, I’m still not sure! Help! What do you think? Are you subscribed to any? Have you been subscribed and cancelled? I need your advice! UPDATE: I’ve now unsubscribed from Glossybox – thanks for helping me make a decision!